..... Balance Trading .....: My First Post -- Where Are We Going? SGS is still long, but blinking short. Both RTS 20090326 and SG RTS 20090326 Long Portfolios have been updated. I think Market is in a good shape. SPX after gaining 43.5% since the March bottom, has shed about 12% of its gain which is quite typical of a strong bull market. 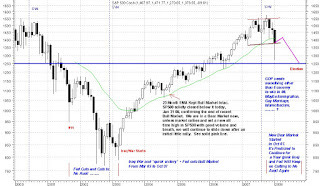 SPX has come to a very formidable support at 880 (thin brown line) which is not only the Neck Line for two H&S patterns (a Bottom H&S shown in blue and a more recent Top H&S shown in red), but also the 200 D-SMA. 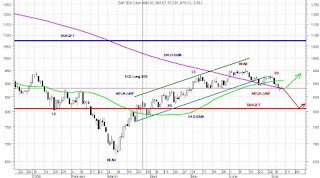 I think this support will hold and SPX will resume its advance (green arrow). If we close solidly below this support, we very likely follow the red arrow back down to 810 which happens to be the 50% retracement line for the gain since March lows. I doubt very much if we go any lower. The question is how real is this rally and how far can it continue. I think this rally is very real and it'll very likely keep going for a long time. Everyone is behind this rally in one way or another. That includes, the Government (Fed, White House, Treasury, Congress, etc. ), Wall Street (trading firms, analysts, etc. ), companies with their cooked up books, the mainstream media (Jimbo the clown included), foreign governments and their central bankers, etc, etc, etc. It seems to me the "plan / policy" is to inflate our way out of the current down turn. In other words, we're creating another bubble (plus ca change, plus c'est la meme chose), but this time we have nothing to inflate with, but Inflation itself. (rhymes with "we have nothing to fear, but Fear itself"). This, however might turn out to be the mother of all bubbles and it has a really good chance of working as long as it doesn't pop anytime soon. The plan (more like hope) is to let the air out slowly after the economy starts to grow and maintains its growth for a while. 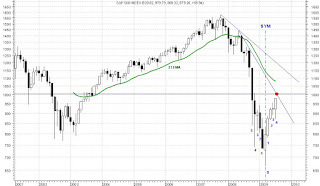 SPX is recovering in a very symmetric fashion and hence giving us the V-shape recovery we like. (a nice "V", "V like victory", I'm glad we're getting something for all the money we've dumped into this). The candle stick for this August is going to be like the candle stick of last October (stick 5, left side of SYM) expect it'll be a white one. Hence, August is going to be volatile like last October, but more tame. I think SPX 1000+ is going to be a tough resistance to over come. Market very likely has to try to break through it a few times (at least twice), but I think we'll have a successful breakout and we'll close August nicely up. My guess at this point is that by end of August we could see SPX near the 23 M-EMA line (thick green) at or about 1080, but we might have to visit mid 900 on our way there. As T. Boone Pickens would have said, 950 before 1080. My plan is to sell all my positions at SPX 1019 (there's a good chance we get there next week or the first week of August) and try to re-enter in mid 900 probably sometimes in mid to late August.